Leading-edge CFOs understand that shaping corporate culture is an imperative of their role; indeed, culture is part of their fiduciary responsibility. New Year’s resolutions aren’t just for people trying to drop a few pounds or organize their closets. With 2014 fast approaching, corporations, too, are thinking about what they might do differently in the year ahead. Unfortunately, like the millions of Americans who will fail to stick to their New Year’s resolutions, so too will many corporations see their change initiatives fall short. According to a new survey by the Katzenbach Center at Booz & Company, only about half of corporate transformation initiatives accomplish their goals and sustain the results. These findings have significant implications for CFOs, who often are at the heart of change efforts. With their 360-degree view of the organization, they are frequently the first to identify the need for change and among the handful of leaders who can drive it. And, of course, they are directly responsible for change initiatives within their own department, the performance of which bears in a myriad of ways on the success of the corporation as a whole. • A stunning 60 percent of survey respondents say culture is even more important to business success than a company’s strategy or operating model. • Only 35 percent of survey respondents say their company’s culture is managed effectively, and 51 percent say it needs a major overhaul. • The top barrier to sustainable change is too many competing priorities, which leads to “change fatigue” among the corporate workforce. • The most common reasons survey respondents give for their company’s resistance to change are skepticism attributable to past change failures and a feeling that employees are not involved in the change process. 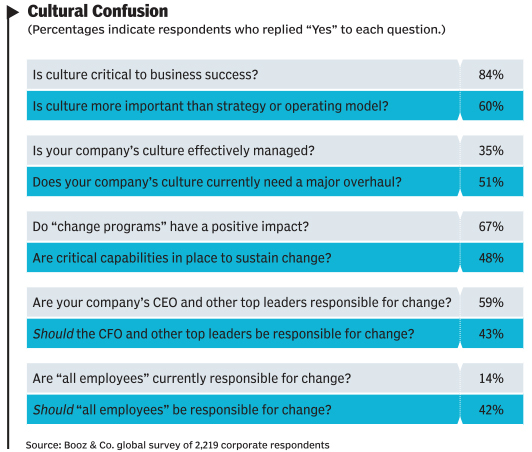 The last two items on that list illustrate how important culture can be to successfully managing change. Companies that careen from one initiative to another, that don’t involve frontline employees, and that don’t seem to learn from their mistakes are companies that are creating, knowingly or not, a culture of failure. Finance and the CFO are in a unique position to influence corporate culture, and in particular, to drive a performance culture. Finance’s view extends across the enterprise, without bias toward individual businesses. 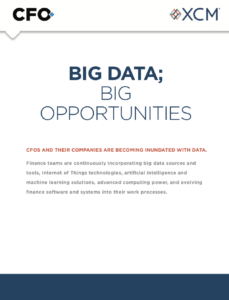 It has access to enormous amounts of data, and by connecting the dots in that data, finance leaders can often spot and define performance trends or potential problems before anyone else. The finance function acts as the conscience of the shareholders, ensuring that investments are made in the right places and following up to see whether returns are achieved as expected. Leading-edge CFOs understand that shaping corporate culture is an imperative of their role; indeed, culture is an inherent part of their fiduciary responsibility to shareholders and the board. The Katzenbach Center’s survey findings, and its experience in working with clients, suggest a way forward for CFOs and other senior finance executives who want to do more to create a corporate culture that facilitates real, sustainable change. It starts, of course, with laying a solid foundation: ensuring that management processes and systems are sound; leading the company’s planning, budgeting, and resource allocation processes; and setting the tone and focus of business review sessions. However, these are only table stakes. In addition, CFOs must set the example by encouraging open discussions about market trends and business performance, about business opportunities and risks, and, yes, about business failures — not to assign blame, but to assist in identifying strengths and weaknesses and in finding solutions that will work better in the future. Over time, this approach creates organizations with a better culture of performance. CFOs also must shape cultural priorities through their interactions with their senior peers, and through deployment of finance partners who can engage business leaders to drive better performance. These partners must have financial acumen, of course, but also a strong understanding of the business and its drivers, the ability to tell a story about business performance, insights on where to take the business and how, the communication skills to influence business leaders, and the confidence to model the right performance-enabling behaviors. Recognizing that such talent is hard to find, nurture, and retain, leading CFOs will employ multipronged approaches in order to continually develop the next generation of business partners, offering clearly defined career paths, training programs and rotating assignments that provide broad experience across the enterprise. In employee performance reviews, leading CFOs will create a safe environment in which to discuss underperformance and acknowledge errors and prudent risk taking. The CFO’s personal leadership in these undertakings is crucial. Spending time with finance leaders, codeveloping a vision with them, engaging them in the process of being culture change agents and encouraging them to test their own leadership style creates permission for finance-enabled cultural evolution. It encourages members of the finance team to see themselves as change agents in the businesses they support and as co-leaders in business performance. If you’re not sure how your finance organization measures up to this model, ask yourself a few questions. Do your non-finance colleagues view your department only as an accountant and report generator, or also as an enabler of solutions? Does your department encourage, or discourage, prudent risk taking, new ideas and innovative thinking? Does it provide an invigorating work environment for finance professionals, who are thus excited about their impact on the business and their individual professional growth, or does it stifle their contributions and development? Finally, does finance act on — and build on — the organization’s cultural aspirations, or simply act as a support function following the lead of the business? Perform an honest culture and capability assessment. Assess how your finance team is viewed in the organization, and your finance team’s ability to enable behavioral change. Do you have business partners who can help engender a performance culture? If not, how can you help develop those capabilities? Also, how can you help finance employees see their roles differently, and act their way into new behaviors? Focus on the “critical few.” Set a small number of clear behavior goals rather than many. By concentrating on just a few, you should be able to avoid situations in which people feel overwhelmed and simply do nothing, unsure of where they should focus their efforts. Build employee pride and commitment. Among survey respondents who said change efforts at their company had proved sustainable, 70 percent credited their employers with leveraging employees’ pride in and emotional commitment to the company as part of those efforts. Look for ways to connect finance workers to a mission that matters to them. Offer frontline employees an opportunity to participate in creating that mission, giving them a personal stake in its future. However, be sure to make the mission tangible and actionable. Lofty goals, no matter how well intended, often end up being words on a page that have no impact. Demand leadership at the top … including from yourself. Only about half of all employees say their leaders treat culture as a priority on a day-to-day basis. CFOs, in particular, must see themselves as owners of the culture agenda rather than dismissing it as a “soft issue” for the chief human relations officer. But this means CFOs must talk the talk and walk the walk. They must act their way into new behaviors, recognizing the impact they have on the culture of the organization and infusing cultural aspirations in their daily messages by talking about performance, what it means for the business, and how finance contributes to it. Finally, they must hold themselves accountable for achieving their performance goals and supporting the business. Culture change is not a shortcut to corporate success, nor is culture-led transformation easy. But developing a strong and positive corporate culture can create an organization that is both receptive to and capable of change. C-suite executives may or may not acknowledge this explicitly, but their employees understand it at a visceral level. 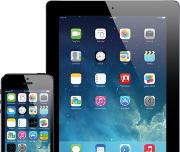 More than 80 percent recognize it as critical to business success. Because CFOs have a broad perspective and deep access into every facet of the enterprise, they have a special responsibility and opportunity to lead the way in shaping corporate culture and driving change. They can do it. The Katzenbach Center’s research suggests it’s time for CFOs to start paying close attention to this opportunity. A worthy New Year’s resolution indeed. Rutger von Post is a partner with Booz & Company and head of the Katzenbach Center in North America. He specializes in culture transformation and organizational design and effectiveness in the ﬁnancial-services industry. Deniz Caglar is a partner with Booz, based in Chicago. He has expertise in organization design, corporate function efficiency, shared services, and outsourcing and offshoring. Matt Mani is a partner based in Washington, D.C. He specializes in organizational transformations, cost structure improvement and finance function excellence.